by Dede Weldon Casad, Ph. D.
One of the most fascinating chapters in Texas history has virtually been lost in modern times, especially for the 21st century Texas reader. Some may call it a legend, others a figment of someone’s imagination, but the story of the XIT Ranch is true. 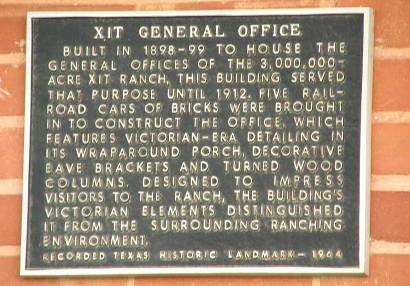 The XIT Ranch was a real ranch in a real part of Texas with real cowboys managing it. It all began when the Capitol building in Austin, Texas burned to the ground. At the time, just following the costly Civil War, Texas found itself cash poor but land rich. There were no funds to rebuild a new capitol. The governor had an idea. With the approval of the legislature, he placed an ad in a national newspaper stating that three million acres of Texas land would be given to anyone who would supply three million dollars to build a new Capitol. John Farwell, a Chicago merchant, saw the ad in the newspaper and was fascinated, as was everyone in those days about the place called Texas. To many, Texas was a magic place. It held intrigue and adventure and Mr. Farwell thought “business opportunity.” But he had no idea how much land three million acres really was. Nor did he ever dream it would become the largest ranch in the world. Farwell answered the ad and agreed to furnish the $3,000,000 for the purpose of rebuilding the Capitol of Texas that had burned down, in exchange for three million acres of Texas land. And the deal was cut. Farwell bought the land sight unseen. “In the Panhandle of Texas,” came the answer. So begin the story of legend of the XIT Ranch, the largest ranch in the world. In time, two Chicago city slickers, Amos Babcock, a seasoned politician, and Abner Taylor a contractor, were sent to Texas: Babcock to investigate the property, Taylor to make arrangements for a new capitol building in Austin. Each was to report back to Farwell what they saw and heard about this new state in the west, but most of all to confirm the wisdom of his decision. After their report Farwell immediately realized that one man could not adequately oversee the entire spread, and the decision was made to divide the ranch into seven divisions: Buffalo Springs, Middle Water, Ojo Bravo Rita Blanca, Escarbada, Springlake, Casas Amarillas or Yellow Houses. Each section had its own manager and cowboys to operate its portion of the ranch, but the task still remained difficult and at times overwhelming. The struggle to survive in this god-forgotten, dry, dusty land took rough hands, hard muscles, saddle sores and innovative solutions. The unanticipated dangers of water shortage, prairie fires, wild lobos and cow rustlers were a constant threat; cowboys, living without proper shelter, on a limited and unhealthy diet with no change of clothes, resulted in fights and disenchantment; and the arduous trek of moving the cattle to market without suffering from stampedes were only a few of the many hardships to overcome with such a vast enterprise. When funds began to deplete, Farwell sailed to Europe to seek new capital from his mercantile friends in England and France. Unlike Farwell, the British investors wanted to see the land before committing their money. The first time foreign investors with titles of ‘Earl’ or ‘Lord’ came to Texas to view their stake in the XIT Ranch is a story in itself. After the turn of the century, when the ranch was over twenty-five years old and still not turning an adequate profit, John Farwell, and his brother, Charles met to discuss their options. Both men were now in their seventies. The fate of the ranch rests on their decision. Was the deal a good one? Was Farwell found foolish or a financial genius? Author Dede Casad, in her new book: Farwell’s Folly: the Rise and Fall of the XIT Ranch in Texas, tells the story of raw courage, unexcelled hardship and innovative procedures in developing the legendary XIT ranch; the beginning of the cattle industry and the initiation of the cowboy as an icon into the Texas culture. Casad brings to the modern reader this true story of a chapter in Texas history that is almost lost or forgotten in the dust of time, but holds within its borders the elements that not only made Texas what it is today, but defined its distinctive character for centuries to come. Dede Weldon Casad, Ph.D., is a native Texan and author of more than a dozen books, including Farwell’s Folly: The Rise and Fall of the XIT Ranch in Texas, available at Amazon.com in paperback and Kindle formats. Casad lives in Dallas, where she has participated in a wide range of business and civic activities. Learn more at www.DedeCasad.com.